I intend to keep a close eye on Australian house prices as I build my retirement investing today portfolio. This is because Australia is a very likely retirement possibility (if not sooner) for me. I do this by watching the quarterly releases from the Australian Bureau of Statistics (ABS) which is what the content of today’s post is however on a more regular basis I watch the data coming from RPData with my latest post here. 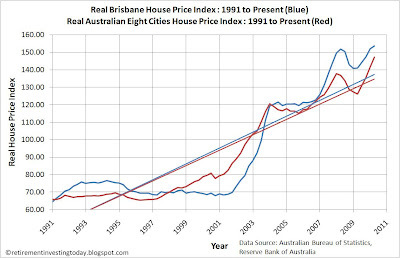 The first chart today shows the quarterly Real (adjusted for the Consumer Price Index) Brisbane and Real (again adjusted for CPI) Australian Eight Cities (Sydney, Melbourne, Brisbane, Adelaide, Perth, Hobart, Darwin & Canberra) House Price Index with data taken from the Australian Bureau of Statistics catalogue 6416.0 since 1991. This Index was reset in 2003/2004 and so I have “corrected” pre March 2002 data by taking the ratio’s of the pre and post September 2003 to June 2004 data as a multiplier. This chart carries data only until March 2010 and clearly shows a nice dip at the start of 2009 before the latest data point has taken house prices to new record real highs. My second chart shows Real Annual Changes in price from 1995 to present. In Real terms year on year Brisbane has seen prices rise by 9.0% (up from 7.9% 3 months ago) and the Australian Eight Cities has seen prices rise by 16.6% (up from 11.2% 3 months ago). 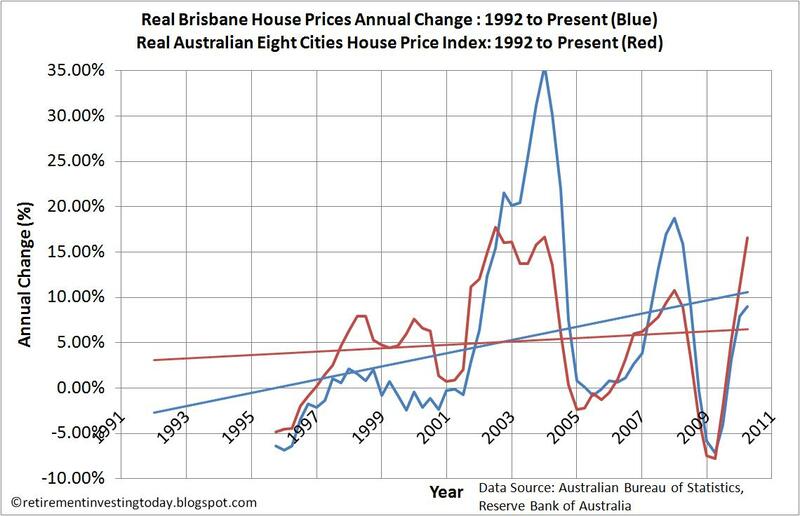 In Real terms over the period since 1995 Brisbane has seen average increases of 5.3% and the Australian Eight Cities has seen average increases of 5.1%. Unfortunately for me though the trend lines (particularly for Brisbane) continue to head upwards. This coupled with the devaluation of Sterling against the Australian Dollar of around 21% in the past year makes Australian property a very expensive proposition for me at this point in time. 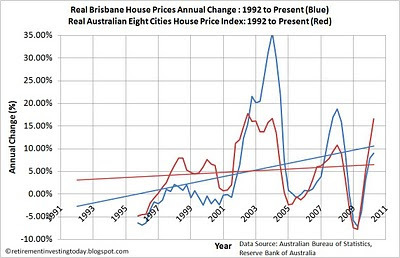 In non-inflation adjusted terms year on year Brisbane prices have risen by 12.2% (up from 10.2% 3 months ago) and the Australian Eight Cities has seen prices rise by 20% (up from 13.5% 3 months ago). 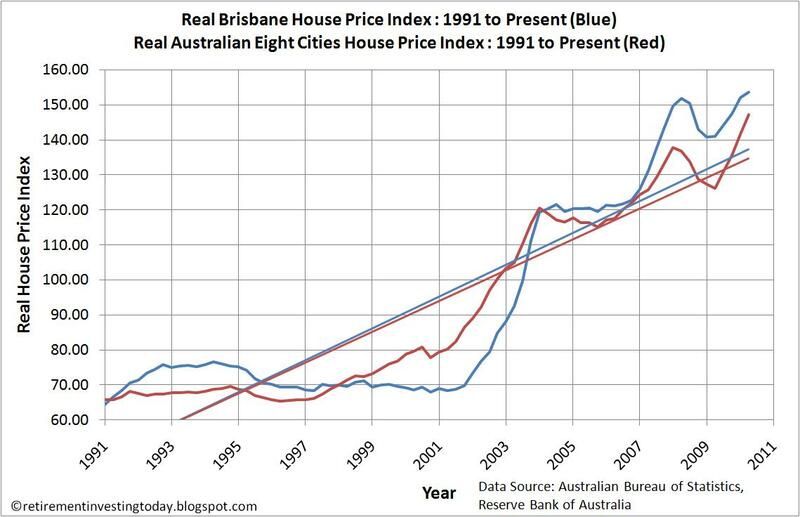 Over the period of my dataset Brisbane prices have seen average increases of 8.2% and the Australian Eight Cities prices have seen average increases of 8.0%. Unfortunately if you don’t already own a property you continue to be priced out when compared with average earnings. 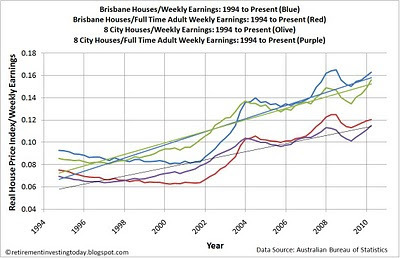 Using the Australian Bureau of Statistics catalogue 6302.0 (extrapolating the last quarter as the data is not yet released) which looks at average weekly earnings shows Total Weekly Earnings at a yearly 3.4% and Total Full Time Adult Earnings at 5.5% meaning property just again became even less affordable. My third chart shows what happens when house prices continue to rise at a rate greater than salaries. 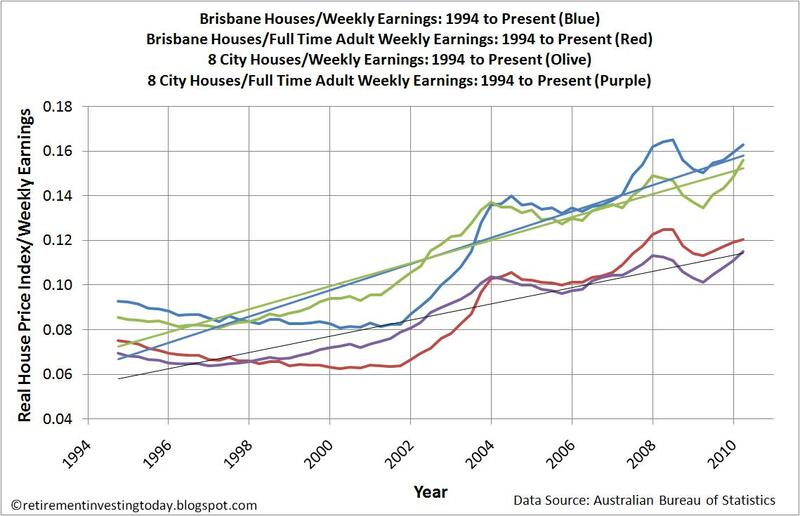 Over this period affordability of Brisbane houses when compared to Adult Full Time Weekly Earnings has gone from a low of 0.063 to 0.120 meaning affordability has halved and the Median Eight Cities houses have gone from a low of 0.064 to 0.115 which is a huge reduction. This type of shift is just not sustainable but when/if will the market return to a more sustainable equilibrium. It’s still some time until I make my move to Australia. It will be interesting to watch what happens. Will it stay inflated like here in the UK or will it see falls like we have seen in the US?